Pleckgate - Race For The Line – Rocket Success!! Pleckgate High School Year Seven students are hoping to rocket to success in the Race For The Line national competition. The aim is for student teams to design and make the fastest rocket powered car they can and compete with their designs nationally. Every team’s car will use the same size rocket motor and compete over the same track distance. The winning teams on race days will have the cars that have the most efficient aerodynamics, have lower mass and have safe, well-designed wheels that reduce friction and can survive the forces of a high speed run. Pleckgate, along with other schools in Lancashire and Cumbria, have received funding from Burnley engineering company Fort Vale to help them compete. 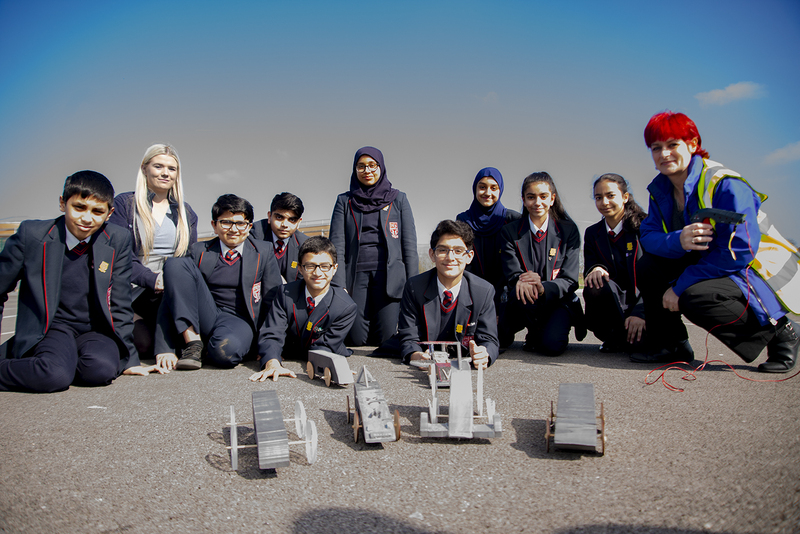 “The students have been working so hard every lunch-time for four weeks to build and design their cars,” said engineering teacher Denise Turnbull, who has been trained as an accredited rocketeer for the competition. 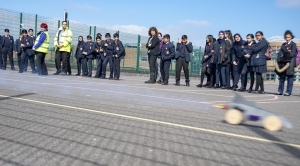 The 18 teams of four at Pleckgate raced their rocket cars at school, with iPads marking the time and the cars were also weighed to find the winning team which was called CR7. They made an aerodynamic car which had a speed of 20.41 m/s and finished the 20 meter race in 0.98 seconds. Aniqa, Mariyah, Hakima and India will now go through to the Regional Finals at the Transport Museum in Bury on 30th April, hoping to qualify for the National Finals where the overall winner will receive £1,000 worth of STEM products from the Dendrite Shop for their school.